Thai Coconut Chicken Soup - delicious, low fat version of popular Thai dish. 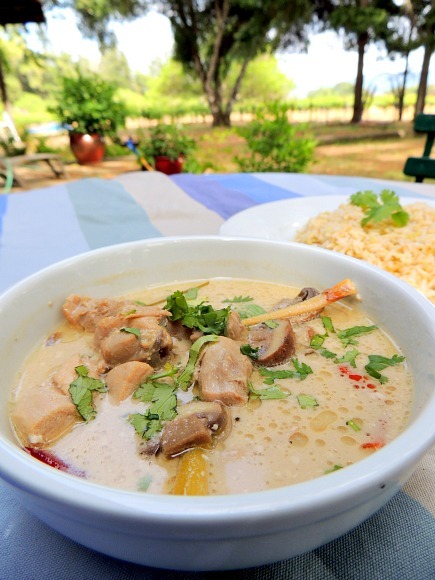 Thai coconut chicken soup will be found in Thailand with a slight twist. It’s more likely going to be called chicken galangal in coconut cream soup. Galangal is a peppery root vegetable that is difficult if not impossible to find here. This is made sans galangal and with coconut milk which makes it quite creamy and filling. Coconut milk is fresh coconut that has been crushed so that it is very creamy and rich. Coconut milk lite has had water added or left in and makes a lighter soup that is still quite filling. This interpretation, which is a Thai coconut soup with chicken, is incredibly delicious with the fragrant flavors of lemon grass and the rich blend of spices and lime juice. It will taste so rich and so very yummy you will not believe it is not in the least bit fattening but it's not. Coconut contains saturated and monounsaturated fat and it is a very healthy plant fat. Unrefined fats do not make you fat. It is cane sugar (and other high glycemic sweeteners) eaten with fats that triggers fat storage. This soup is one of our printable low glycemic index recipes. Put 2 cups of brown rice on to cook while you prepare the soup. If you are not using a rice cooker then put 4 cups of water on the stove to boil. When it comes to a boil put in 2 cups of rice, turn heat down to a simmer and put a lid on the pot. Brown rice will be done in 40 minutes; white rice takes only about 20 minutes, when the rice has soaked up all the water. While the rice is cooking, cut the chicken into bite sized pieces and put aside. Put the coconut milk in a large soup pot, add the water and bring to a boil over medium heat. When it starts to boil, reduce the heat to a simmer. Rinse the lemon grass and cut into 1” lengths on the diagonal. Take the bottom of your knife and pound the lemon grass until it is pulverized just enough that it can release it’s flavors. Add the lemon grass to the coconut milk and continue boiling for a few minutes until there is a lemon fragrance coming from the soup pot. At this point you will know that you are in for a big treat! Add the chicken and all the seasonings including the lime juice and simmer until the chicken is done which takes about 10 minutes. You've rinsed and sliced the mushrooms thinly by this time so add these and cook about 5 minutes longer. You can take out the chili now or add more fish sauce and another chili if you need more flavor. The smell will be heavenly by this time and you are ready to eat! Serve as a soup with the rice and a simple salad. I think a plain spinach salad with a vinaigrette is perfect. You could make rice noodles instead of the rice if you prefer. This may be my favorite Thai dish. You can make it as spicy hot or as mild as you like depending on your capacity for the pungent flavor and how many chilies you put in. It's the chilies that give it the intensity. Thai people generally eat it pretty hot but most Americans aren’t used to that much heat. It’s ambrosial even when mild. It will make an elegant dish for guests or a great family favorite or both. Kids seem to love Thai food when it’s not too hot and it’s perfect for those with gluten and casein sensitivities. Return from Thai Coconut Chicken Soup to Low Glycemic Recipes. Return from Thai Coconut Chicken Soup to Lifetime Fat Loss home page.